It was some years back. We were browsing the isles of a large bookstore slowly making our way to the coffee-bar-café. I was thirsty and noticed a line of people forming at the counter. But at Dean’s words I stopped in an isle of paperbacks. “What do you think of these covers?” he asked me. “What? All these? Really?” I exclaimed. He nodded soberly. A little shiver went up my spine. In this public place Dean’s face showed no emotion. But I knew the depth of disgust beneath his words. “These are the kinds of books marketed to children that are keeping publishers in business, evidently,” he told me. I felt sick. I probably showed it. But my husband is used to the embarrassment of being married to someone who unlike Elinor of Sense and Sensibility, has never learned self-control in regards to facial expression when agitated. I retained the same sickened-look while standing in line at the congested coffee bar. Young people learn more about the world (each waking hour it seems.) And they crave a bit of society. For our children this meant taking part in small circles for ministry and extracurricular activities. We invited people into our home, both young and old. Outside activities widened horizons in ways that were edifying to themselves, their friendships, and the local community. The humanities widen horizons, too. Human thought expressed in (history, biography, novels, plays, poetry, music, film) drop the reader into a kind of society in very intimate ways. For the Christian parent book choices for teens may seem difficult. Why? A closer look at the realities of life, than in previous years, is observed. More sophisticated themes are introduced. If literature reflects the truths of life, how far should our steps take us into the dark side? It helps to place reading in three categories. The maturing student faces hard truths. In his reading he meets tragedy, sorrow, poverty, greed, and worldviews of nations that have led to the slaughter of countless innocent men, women and children. Christians are being martyred and always will be until Jesus returns triumphantly. But as I’ve written before we can accompany hard truths with hope. How? We include the helpers. The helpers are those who uplift society uncompromised by those among us who drag society down. Although secularists think themselves justified in hiding the faith of helpers, healers, and heroes, quite often, and with a little further investigation, we find that these people turn out to be Christians. As children mature they learn to reason. They have built a solid foundation in the Word of God and so can detect fallacies and falsehoods. *4 Do we need to address every blasphemy? No. Rather, we help students to principles, which should enable them to discern. *5 For there is a third category of knowledge that is best placed at a distance. This category often includes best sellers – the talk-of-the-town online in books and film – the big moneymakers. But if a celebration of sin explicitly darkens the page, we use the Joseph Approach. We flee. Jesus sent out his disciples as sheep among wolves. He warned them to be shrewd in recognizing evil but to remain as innocent as doves. *6 In the Old and New Testament we are given lists of sins that seriously displease God because they go against His law. To “get the drift” of evil and perversions we do not need the gruesome details. We mustn’t let our curiosity be entertained by them. Those in the military and law-enforcement (the rescuers and protectors) in some instances must step into the perversions and violence of the dark side, but we must not. Recently Dean photographed a flock of black and white birds congregating around our neighbor’s icy pond. “Oh, these must be snow geese,” I said. “Paul Gallico.” I said. I explained and added, “I thought I heard honking.” Soon after, I splurged and put Paul Gallico’s short story, The Snow Goose on my kindle. It's a 66-page-gem. If you are familiar with my writing you will be surprised to find such a strong statement here. But let the truth be told. 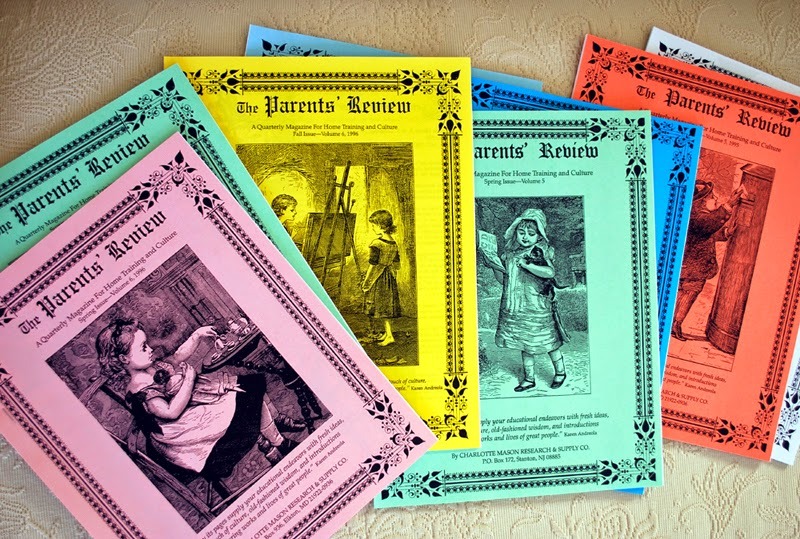 We amassed such a collection of books during our years of home teaching that we were never without something good to read. Starting with delightful picture books children can develop good taste in reading. What happens when we are equipped with books in category one and two? We spread our wings. We have caught the impulse to live beyond self-satisfaction. We understand God’s love. *8 It is about serving God by serving others. It is about being one of the helpers. We sheep among wolves go about our business uplifting society. However lowly, unsung, or ordinary our part in it might be, we are on the Lord’s side. Blog friend, Amy who lives in sunny Florida (nice! ), finished her Lavender Strawberries. Of her large family of children she has one girl. Amy is always looking for sweet feminine activities to share with her growing daughter. Thank you for sending your photograph, Amy. May your daughter continue to enjoy a Beautiful Girlhood. 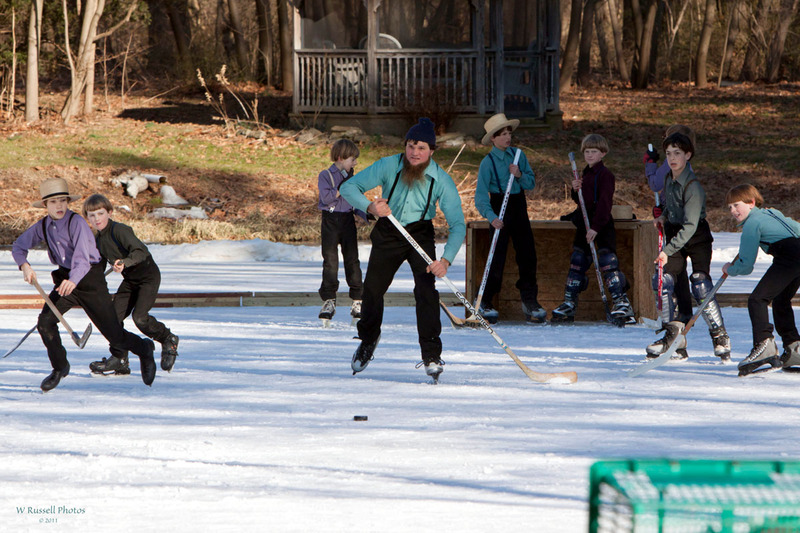 I like the photograph of the Amish taken by our friend, Mr. Bill Russell. Mr. Russell is a professional portrait photographer here in Lancaster, Pennsylvania, and a very good one. 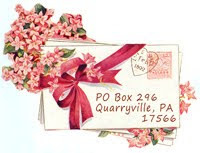 To see more views of Lancaster County visit his website. 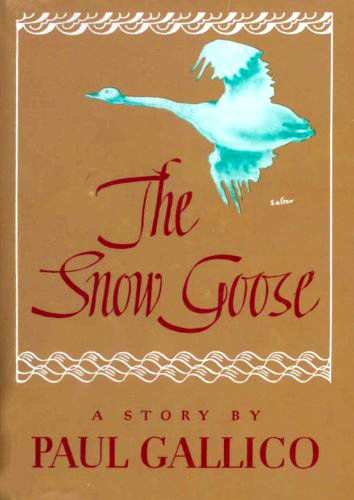 The Snow Goose by Paul Gallico is appropriate Good Stuff for junior high and high school. 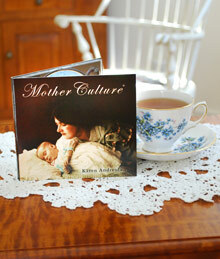 I enjoyed it for Mother Culture. It helps to know a little about England's efforts at Dunkirk during WWII. We worry about holes. But take heart. Education isn’t about filling inevitable holes. It’s about expanding horizons. 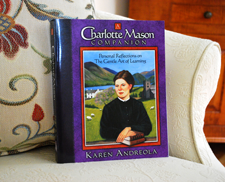 See A Charlotte Mason Companion, chapter 4 & 5. 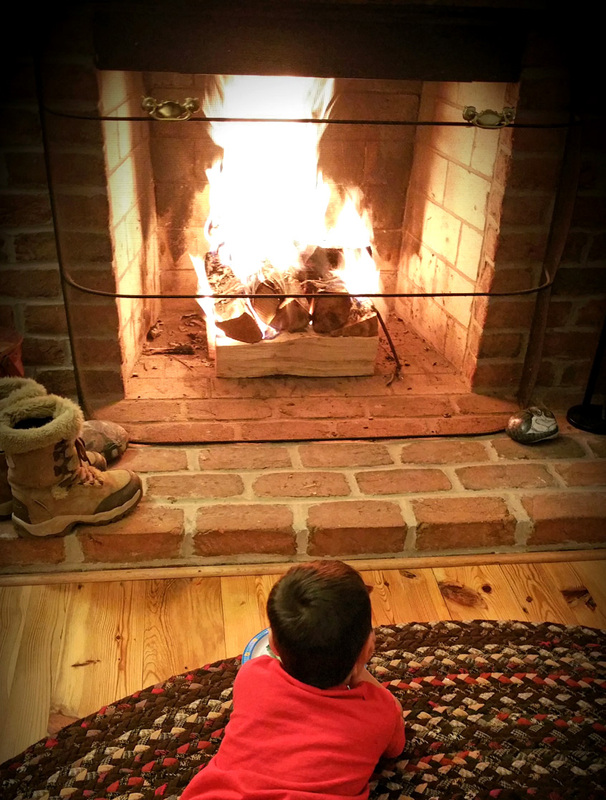 What do you do indoors when Jack Frost is nipping at your door? You take advantage of the fireplace. You keep your hands busy. 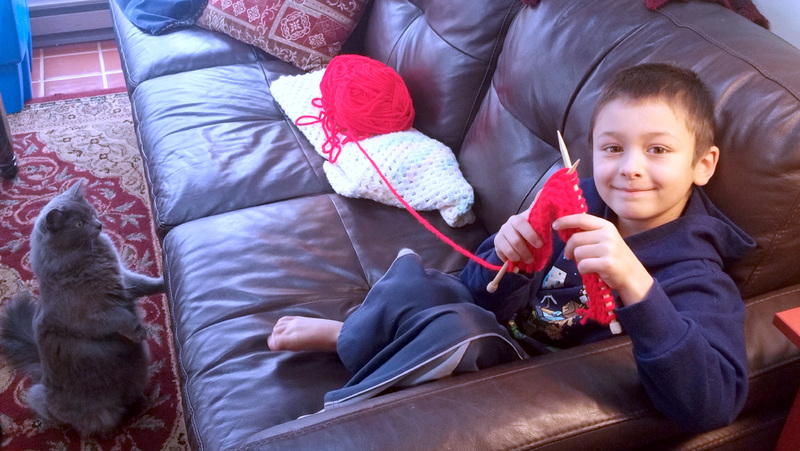 One grandson asked be be taught how to knit. He has taken to it with gusto. His cat wants to get into the act. And you read a book that warms the heart. 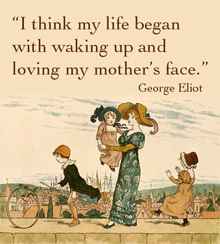 I asked Sophia (the mother of the above boys) what she remembers to be the most enjoyable book of her childhood. "Caddie Woodlawn," she said. Years ago all my children read it - silently - so I was out-of-the-loop. Recently, I picked it up. Immediately afterward I read its sequel. Now I know why Carol Ryrie Brink's writing is so well-loved and won a Newbery Award. 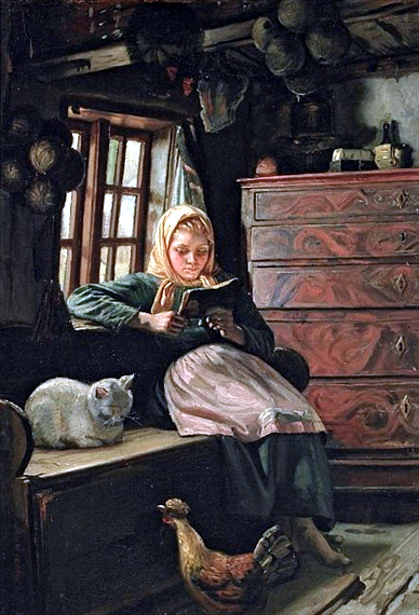 It is so pleasant to read a story where you like the characters and the author obviously does, too. We can guess the source of this mutual affection. Caddie Woodlawn is the author's grandmother. 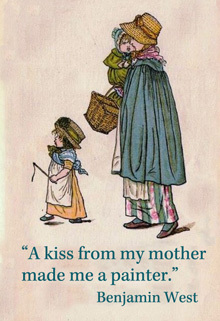 The incidents are based on what Grandma remembered about her girlhood days in the Wisconsin of the 1860s. The stories are true. Carol Ryrie Brink writes with uplifting humor. Each chapter is a mini story in itself - is moving, adventurous or sweet - sure to chase away the winter blues - for girls, boys and adults. Christianity and patriotism crop up naturally here and there within the life of this American pioneer family. 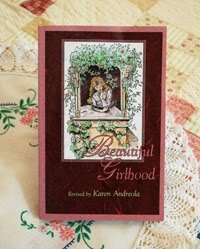 "When I was her age, I could make bread and jell and six kinds of cakes, including plum, not to mention all the samplers I had stitched which anyone may see if they care to look in my marriage chest." Father believes that it will just be a matter-of-time and Caddie will adopt womanly manners. But by chapter 21 some direct words are called for. After Caddie pulls a prank, Father sits down with his daughter in private. He gives her a serious talking-to. But Father is a gentleman. His talk is beautifully stated and worth the price of the book. Caddie receives it well. She trusts her Father. "It is the sisters and wives and mothers . . . who keep the world sweet and beautiful," he tells her. "What a rough world it would be if there were only men and boys in it . . . " A page more of practical and inspiring words round out this gem of a speech on the strengths of womanhood. It brought a tear to my eye. I wonder if the samplers made by Caddie Woodlawn's mother were kept in the family. Or if Caddie herself ever settled down to stitching one. Samplers were first made for recording alphabets used for marking dainty linens. They were kept in a sewing basket for reference. As the 18th century progressed samplers became picturesque. Elaborate scenes were created below the alphabets. 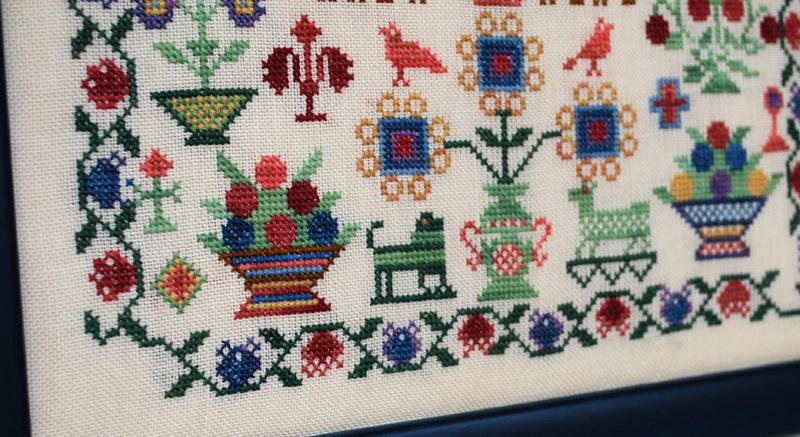 The needlework was adorned by a border of flowers or strawberries. Watching the BBC 1995 TV Series, "Pride and Prejudice" I noticed, in one scene, patient Jane sitting with needle and thread sewing what looks to be a sampler. How do I know? A tell-tale border of strawberries edges the linen in her hands. Green dogs? What was Ann thinking? Within a decade or two after the American Revolution town schools (although with some opposition) were allowing girls. Besides studying their books girls did "regular stints . . . of knitting and sewing." This was plain sewing for the household. But they also did fancy sewing. 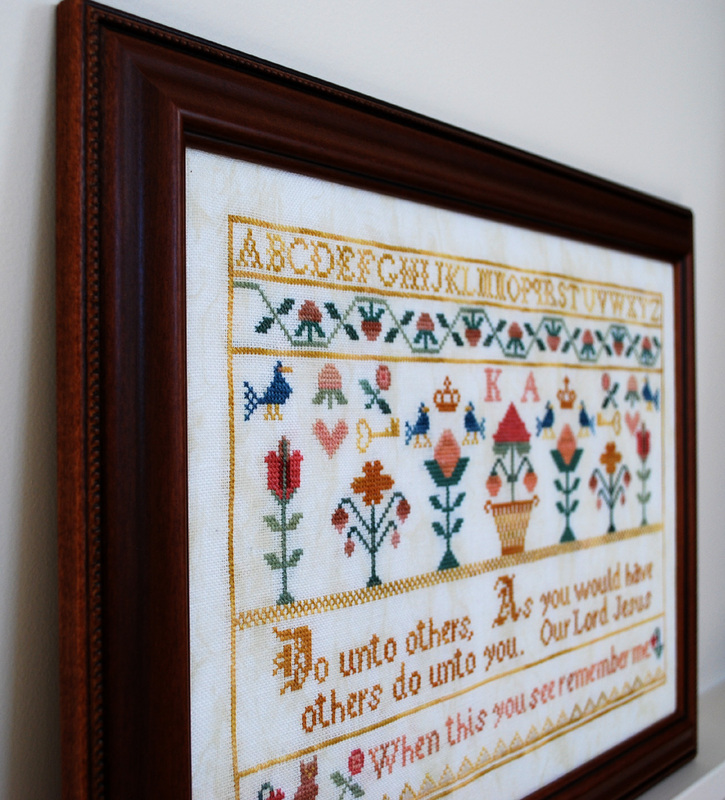 Each girl made a decorative sampler which was expected to be a household treasure ever after. *2 Proud parents would frame the sampler and place it on the wall of the parlor. 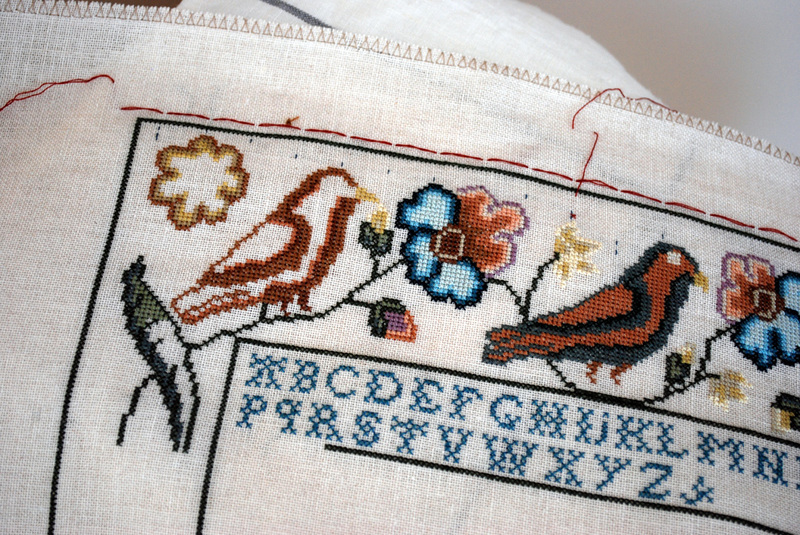 By the late 19th century, sampler-making was becoming less popular. Curriculum was changing. But it was given a mention by Charlotte Mason. Among the useful handicrafts, knitting and rug-hooking, etc. she recommends "samplers on coarse canvas showing a variety of stitches. "*3 Today girls might start with Aida cloth. My newest project is "Anne Anthony - 1786" - (below). The original is in the Museum of Fine Arts, Boston. All I can show you is my slow but steady progress at the top. It is a challenge in size and detail. The strange threads you see along the top, etc. are my way of marking off the tens. 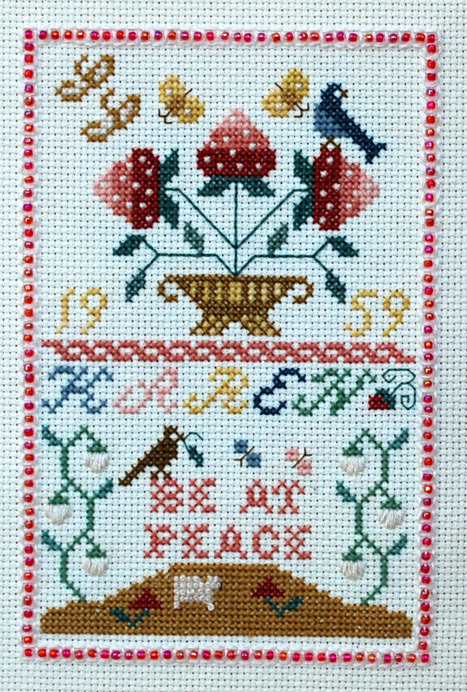 Among the alphabets, birds, and flowers, there is (not shown here) a blue house to be stitched soon and what appears to be a large family dressed in period clothing. The little girl holding the hand of a big sister might be Ann herself. 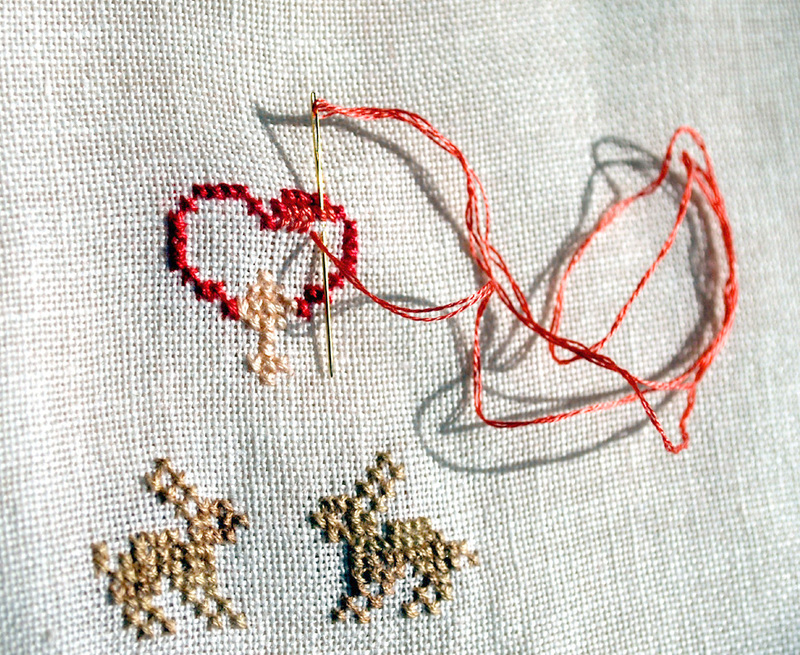 Here's a good tip for stitching large areas. Count alertly. Outline accurately. Then fill in comfortably. Ann Anthony - 1786 stitched lavender strawberry buds in her border. The bird is waiting for lavender silk thread. 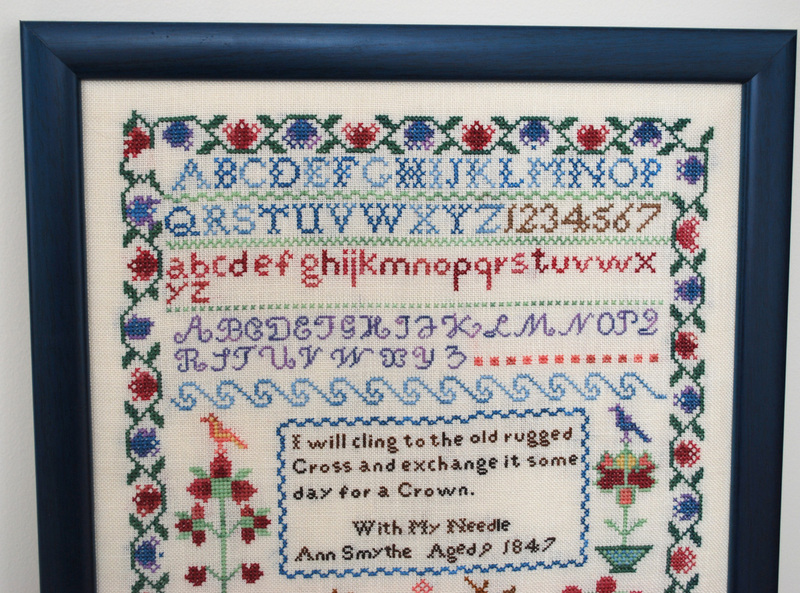 Here is a verse stitched into the antique sampler of Martha Perry in 1800. And wilt though clothe the lilies and not me. 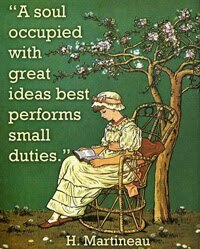 I'm taking my time with "Anne Anthony - 1786." I'm in no rush. I mustn't be. That isn't the way a sampler is created. For Ann it went slowly, too. It took a year to complete most likely. She worked on it dutifully, probably before she would be allowed to play. But the hours she worked on it couldn't have been all grim. The months it took to complete produced the satisfaction of work well done - the joy of accomplishment that is earned by self-discipline. 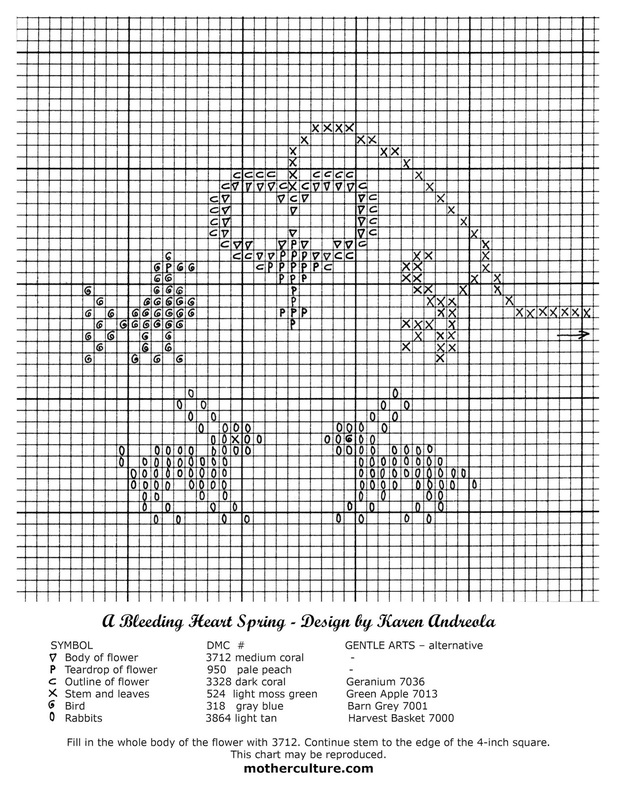 I like small projects, too and in hopes of encouraging beginners I designed one for my blog friends and their daughters - "A Bleeding Heart Spring." I include instructions (scroll below) for beginners. Caddie Woodlawn was written in 1935. (for grade 5 - up). After receiving so many letters from children urging her to write another book about Caddie, Carol Ryrie Brink finally did - ten years hence - Caddie Woodlawn's Family - formally Magical Melons. 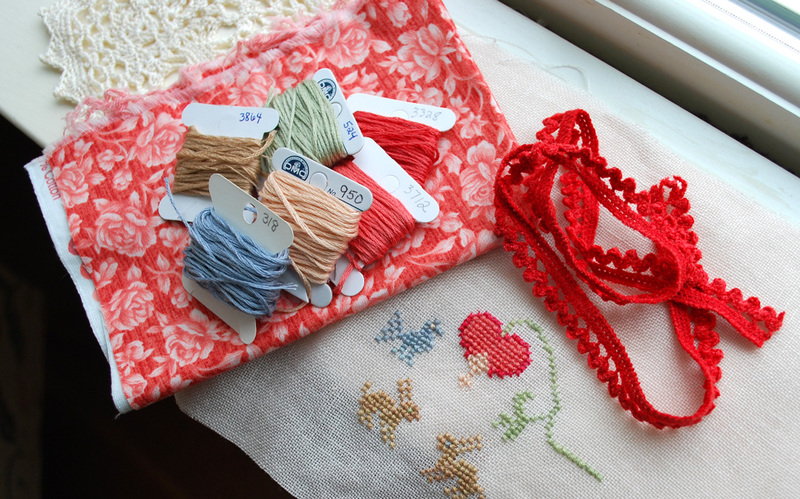 Stitching in the sunny parlor. Four holes on Aida cloth will accommodate one cross. No hoop is needed if stitched gently while snugly. DMC floss has 6 strands. Separate the strands to use two in a size 24 tapestry needle. Start with a 5-inch square (at least or larger) of 14-ct Aida. I used linen. My picture is less than 4 inches square. You can start with the flower a couples inches from the top of your cloth. Outline and fill-in. I started with the rabbits while I worked out the design. Use any color floss you like or those I listed on the chart. 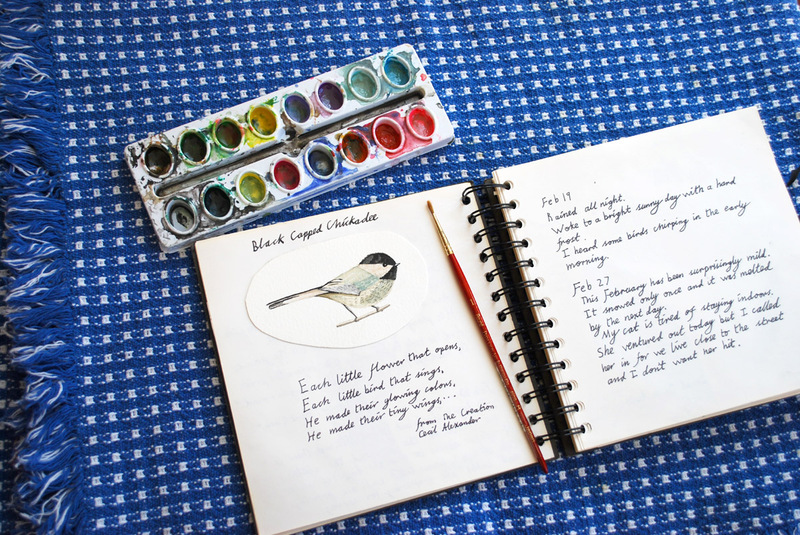 Trace a 4-inch square around your finished picture. 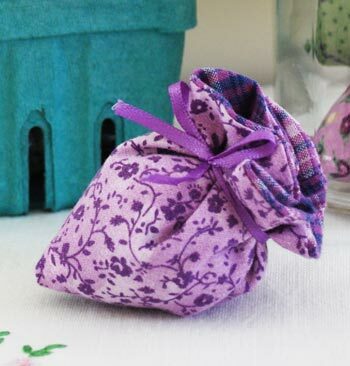 Sew a quarter-inch seam, leaving an opening for stuffing. Under my linen I used a fabric interfacing but Aida will not need this. Choose calico for the bottom. Stuff pincushion densely. Lace at the seam is optional. One of the Christmas gifts I received was tied in bright red chenille rick-rack. 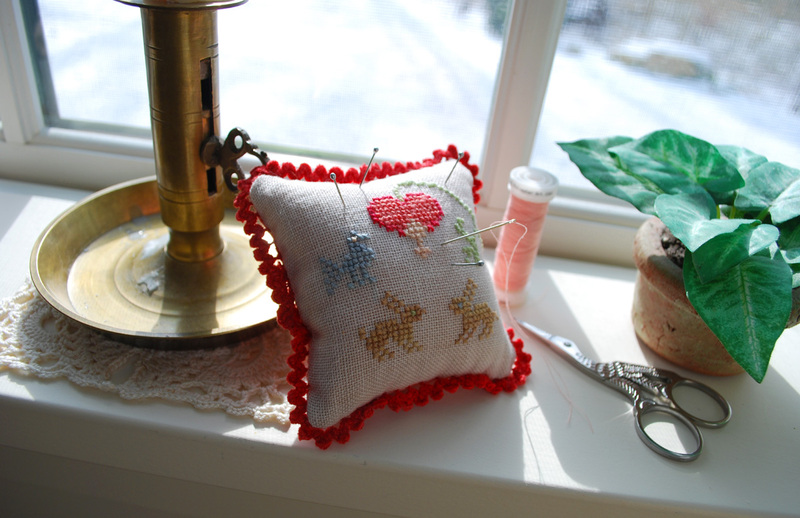 Wanting to use this darling stuff up is what gave me the idea to make my pincushion and up-the-brightness of the thread color of the bleeding heart to match it.